The first task assigned to an oke apprentice is to shave the bamboo nails which, with rice glue, hold the side slats of a bucket together. Since the tough bamboo soon wears down the metal blades, the apprentice also learns to sharpen tools. Shuji’s collection of wood planes number more than 200, with the oldest dating back to the 18th century. Apprentices are expected to make about 300 nails a day. Shuji began shaving nails when he was in junior high school and made enough for him to use for the next ten years. An oke apprentice will learn how to dry wood properly, “read” its grain, and master a variety of tools, including the curved, two-handled plane called a sen, virtually unchanged in form since medieval times. 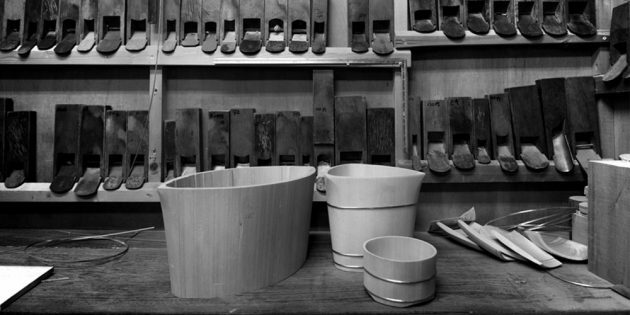 When making the slats that form the sides of a bucket, he will learn to patiently shave off half a millimeter at a time until they fit together so perfectly that no light will pass between. This also achieves water-tightness as well as the seamless beauty of the side panels. The better he becomes at constructing buckets, the less wood will be wasted. An apprentice learns by carefully observing everything his master does. Instructions are rarely given verbally. Over years of watching and working, a quiet transmission of skills and sensibility takes place across generations: for the Nakagawas, from Kameiichi to his son Kiyotsugu, and from Kiyotsugu to his son Shuji. “As was typical of his generation, my dad made 200 to 300 oke per month,” Shuji recalls, “I haven’t even made enough to match his first year.” Kiyotsugu elevated oke-making to an art at a time when more convenient and cheaper plastic goods were flooding the market. Unlike typical oke makers, Kiyotsugu would enter independently produced works into exhibitions. The Nakagawa family carved out a niche by specializing in smaller crafts that require a high degree of accuracy and fine workmanship. In 2001, Kiyotsugu was rewarded by being certified as a Living National Treasure by the Japanese government. Nakagawa Shuji decided to pursue his talents independently from his family in 2003 and now works with four apprentices of his own at his own studio. In addition to oke and yudofu-oke, he also makes ohitsu rice containers, yuoke hot liquid containers, guinomi sake cups, chirori, Nakagawa has stepped outside tradition to create a unique line of champagne coolers, stools, tables and beds for pet dogs. 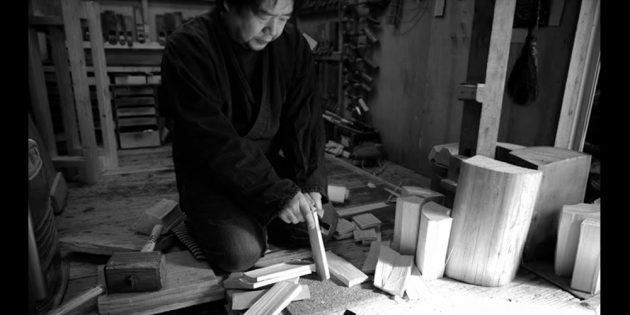 Concerned about the survival of his and other traditional Japanese crafts, he moved to the forefront of a movement aiming to break down the boundaries between craft, art and design by joining together with the sons of five other established Kyoto traditional craft companies to form the Japan Handmade. 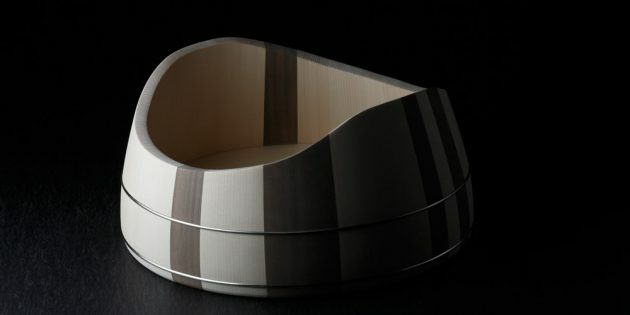 This collaborative, including Kaikado (teaware), Nakagawa Mokkougei (woodcraft), Hosoo (textiles), Kohchosai Kosuga (bamboo arts), Kanaami Tsuji (metal knitting), and Asahiyaki (ceramics) reached out to the Danish Design Studio OeO to help them revitalize their Japanese traditional industries and bring novel products to the international market. Steve Beimel: I’ve spoken with many traditional Japanese craftspeople over the years and they usually say that traditional craft in Japan will end with this generation. But you and the other members of Japan Handmade are very positive about the future of craft here. Where does your confidence come from? Nakagawa Shuji: Traditional products have seen a consistent drop in sales over the past 20 to 30 years. 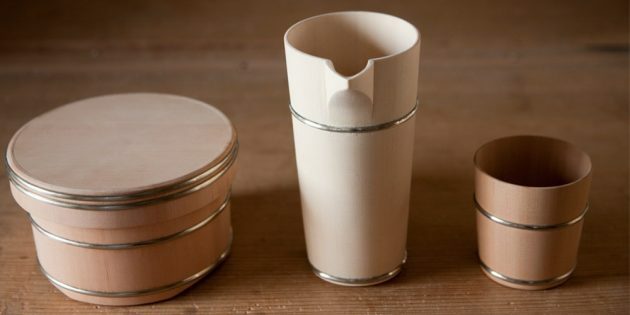 However, though some things like ohitsu (containers for serving hot rice) and oke (wooden pails or buckets) may eventually disappear from our daily lives, if we can preserve and maintain both the construction technique as well as a class of highly skilled artisans, we can apply the same methodology to making new products that are suitable for contemporary living. In addition to new products, however, it seems to me that there is still potential demand for ohitsu and oke. Everyone in Japan has a Japanese bath set up. I think that most young people who have grown up using plastic basins for washing, don’t know the joy of using a hand crafted wooden oke. Isn’t this due to a lack of marketing? In a similar way, while French and Italian textile-related brands are featured in posh districts of every major city in the world, far superior Japanese woven and artisan dyed textiles are almost nowhere to be found, and are even losing major market share to PR-savvy European companies in the Japanese domestic market. I feel the same. The Italians spend 50% of the cost of production on PR and 50% on production. Japan spends 90% on production and only 10% on PR, and we are losing. Maybe this tendency to avoid self-promotion is our national characteristic. At Japan Handmade, because we have confidence in our skill level and the quality of our products, we decided to push hard with PR. I hope someday that it will be common to find internationally-recognized brands coming out of Japan. We have the talent here. We just have to put more energy into the PR. I don’t think that most foreigners grasp what it takes to produce a crafted piece of Japanese craft, just by looking at it. When I take guests to the Japan Handmade prototype showroom and they hear that Hosoo painstakingly reinvented their ancient loom in order to produce the same highly complex, 3-dimentionally woven fabrics that combine silk with gold leaf paper as in their legendary obi but at 5 times the width, they seem to finally get it. When they realize that your champagne bucket with its sleek, contemporary design is made by precisely fitting slats of cedar that are held together with just a brass band, they suddenly become engaged. Since most foreigners are not acquainted with the impeccable, age-old Japanese craft tradition, it may take a lot of PR to raise awareness of craft in Japan. Yes. I believe that it is essential to team up with PR professionals in order to expand globally. But there is also the issue of product design. In Europe, even tiny local craft studios have their own in-house designers. Just like with PR, the design aspect of production is not taken seriously here in Japan. I heard the same thing from the home appliance department people of a major Japanese manufacturer. Though they are very strong technically, their design section is weak. And that’s the reason why they are losing market share. Japanese must become more conscious about and invest in design. And that is exactly what the six member companies of Japan Handmade have done. I have been waiting a long time to see traditional Japanese products evolve with superior design and practical use in today’s world with effective marketing so foreigners can finally understand why they are so special. This should be a nation-wide movement, not just in Kyoto. 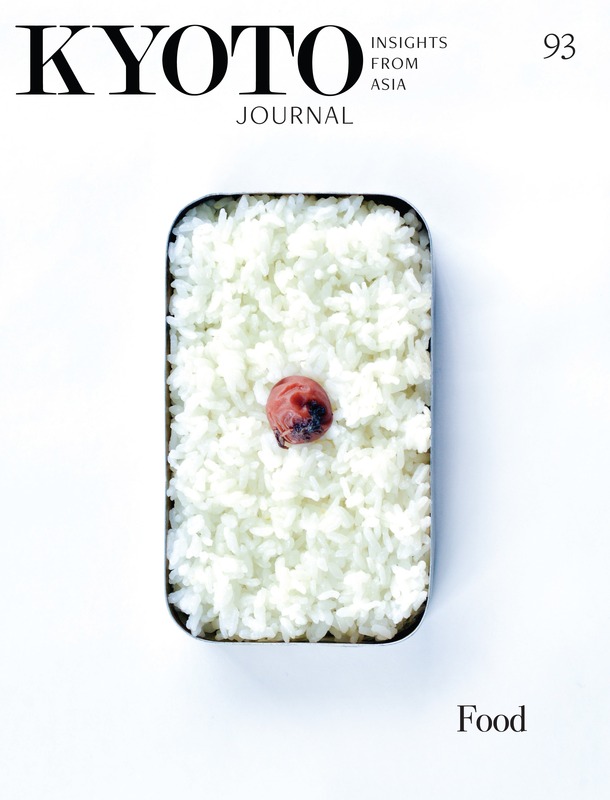 The problem is that we Japanese, ourselves, do not fully recognize the value of what we produce here. Even though I grew up in a craft environment and studied design at university, I didn’t fully appreciate my own family’s work until about 5 years ago. It was only when the quality and value of my work was acknowledged by many people from abroad that I finally realized how great Japanese traditional technique really was. It is difficult for Japanese to come to this realization by staying solely within the Japanese context. Therefore, one of our goals at Japan Handmade is to encourage and support younger craftspeople to go abroad and gain confidence by experiencing this for themselves. You were born and raised in Kyoto, Nakagawa-san. What made you leave Kyoto and establish your home and workshop in Shiga (the prefecture next to Kyoto)? I had worked alongside my father until he was designated a Living National Treasure of Japan in 2001. I decided then that it was time to create my own studio, where I could explore and develop more independently. I chose to leave Kyoto because I was a little afraid of the “Kyoto” brand. I wanted the challenge of creating works, without the benefit of my father’s name or the high reputation of Kyoto. Moving to Shiga was probably challenging, but it sounds like it was also very liberating. Yes, it was. Though working under the Kyoto Brand is a considerable sales advantage, I was afraid that the power of such a brand behind me might camouflage any deficiencies that existed in my work. Leaving Kyoto meant that my work had to stand on its own merits. I see that freedom can often cause anxiety. Have you missed having the back up and support of Kyoto brand? Yes. It is definitely more difficult being on my own. Since Japan Handmade is a new brand that is working to stand alone without the power of the Kyoto brand behind it, I am hoping that it will eventually spread beyond Kyoto to include crafts people working nation-wide. That is exactly why it’s named “Japan Handmade” and not “Kyoto Handmade”. Once this initial effort involving six companies reaches sufficient success, would you consider having other companies and crafts people join in? Definitely. In my opinion, we are currently experiencing a state of market saturation for traditionally-rooted artisan crafts in Japan. We are now ready for new ideas and products to come forth from that state, and I think Japan Handmade is one of those new sprouts. However, there is still much to be done and much to be learned before we can think about inviting other companies to join us. So now is the time to prepare the way by building a firm foundation before you can think of future expansion. Exactly. Increasing the number of members beyond the current six would involve certain risks. It was difficult enough to move six companies forward with the same shared vision. Even within each of our companies, our attitudes and aspirations for the traditional crafts may differ from that of our staff members. So, any company we bring in would need to come into one accord with us. Otherwise there could be a malfunction in the organization. We must all share the same consciousness that we are traditional craft companies functioning in a global environment. So the first priority seems to be the attainment of a credible level of success for Japan Handmade. It may cost you quite a lot of money as well. Yes, financially, it’s probably impossible for one company to enter the global market on its own. Another advantage of six different industries teaming up together is that we can deal with wider range of customers. Some clients may be interested in wood crafts; others in textiles and still others in metal work. Our group can cover all of those needs. 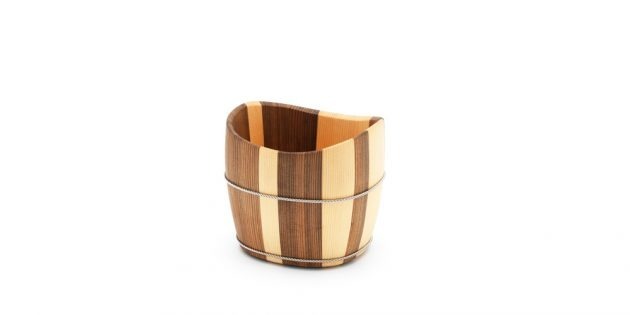 The skills that we had once applied only to our own individual brands are now joining together, resulting in entirely new, higher value products of Japan Handmade that utilize various combinations of wood, bamboo, ceramics, copper, wire mesh and textiles. The founder of Japan’s Mingei folk craft movement, Yanagi Soetsu once encouraged the teaching of technical skills to people with artistic talent. Denmark did that during the Industrial Revolution, and as a result produced many wonderful things. Other countries in Europe, on the other hand, did the opposite by teaching art and design to established technicians and much of what they produced lacked the kind of beauty and strength of design of the Danish works. I guess you followed Yanagi’s way by going to art university first then coming back to your traditional roots. I was not so forward thinking back then, but I now find that my university education is very relevant to my work. At school, I actually used to make objects with iron. I think that there is a certain common sensibility shared by all forms of art. I agree. Though making iron objects has no direct connection to making oke, the artist or designer’s way of seeing and thinking about things is very similar for both media. It is very important for me to maintain this sensibility. That is a crucial point. Apprenticeship has traditionally concentrated on developing technical skill. It trained people to reproduce work as high level journeymen. It can be very challenging, however, for technically skilled artisans to develop the kind of sensibility that will make them artists. Yes, and the opposite is also true. For people who know design but are unaware of production technique, there can be a gap between their ideal and reality. I have recently begun to collaborate with the Nendo Company and am very impressed by its founder, Sato Oki. 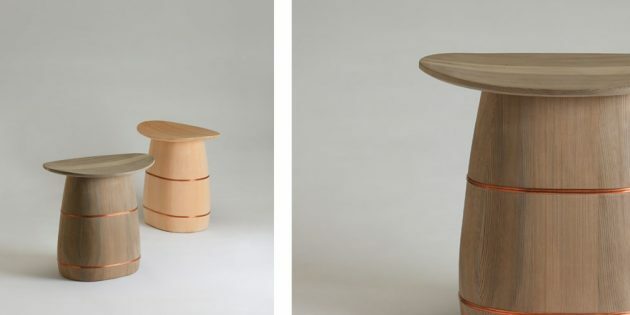 Sato is a highly regarded, internationally recognized product designer who begins each of his projects by first looking deeply into the production process. Other designers seem to limit themselves by only looking at the obvious shapes of the design and, thus, fall short in product practicality. You have had exceptional mentors in your life. I am surprised that so few craftspeople and artists I interview have apprentices. The Japanese apprentice system is so unique in way that the master doesn’t directly teach very much. It seems that it takes about ten years for Japanese apprentices to gain mastership by plugging along through trial and error with very little guidance, whereas if they had had consistent lessons, mastery might only take two or three years. However, this time consuming apprenticeship has produced a level of mastership across dozens of disciplines here in Japan that is probably unrivalled anywhere in the world. I am presently working with my fourth apprentice; my first and second apprentices now have their own studios and are actively applying their acquired skills. I believe that the apprenticeship system will continue on. Unfortunately, effective apprenticeship which combines both production technique with design, is still quite rare. To create a new product, you need someone who can create a prototype, as well as people who can transform that into a product which can be mass produced. For people who learn how to make prototypes in art school, it can be very challenging to translate their work into in mass production. On the other hand, the traditional system of craft trains people for mass production. Ideally, we will be able to combine the efforts of apprentices trained in centuries’ old technique with prototype designers and thus create new products for the global market. The works of many crafts people I’ve met would not be suitable for mass production. But in order to sustain a viable business, production numbers are so important. Japan Handmade is not a collective of “artists” but rather of “industries.” Art is produced as one-of-a-kind pieces where industries produce in high numbers. Actually, the concept of “artist” did not appear in Japan until the beginning of the modern era (after 1868.) There wasn’t even a Japanese word for “art” until that time. So we are somewhat late in catching up to Europe in that sense. There is a growing interest in craft in Europe and the U.S. Up until recently, craft was not given the attention or respect that it may have deserved. The Japanese, on the other hand, have historically maintained a high regard for craft. That’s right. Even as recently as 15 years ago in Europe, for example, I noticed a hierarchy of importance which placed art at the top. This was followed by design and craft was at the bottom. But today, they all seem to occupy the same level. Artist Sugimoto Hiroshi recently was part of an exhibition at the Pace Gallery in London and New York, entitled Mingei: Are you Here? It would have been unthinkable for a craft-related exhibition like this to have taken place at the Pace, even 10 years ago. Top crafts people are now taking their places alongside top artists of contemporary art and design. 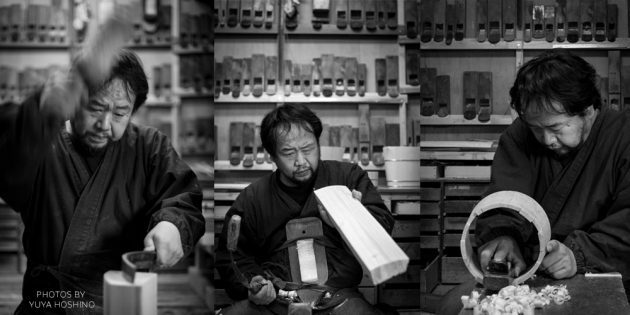 The craftsmen of Japan are collaborating with designers abroad more than ever before. I, myself, had about 15 offers from Milan last year, alone. This is an exciting new era for the craft world. Art went through radical changes in the 20th century. The role of art had been, in large part, to praise the greatness of the God. This was followed by Impressionism, which stimulated our hearts. Later, however, such influences as Duchamp, Warhol and Japanese otaku destroyed the concept of art as we knew it and succeeded in reconstructing it. That is why craft and art can stand on the same ground today. Traditional art was directly accessible to people who were inexperienced in art. Many people find that much of post-war contemporary art and especially conceptual art engages them intellectually but not always spiritually. And though it may be very clever, it often requires significant experience before it is fully appreciated. In addition, since so many of our daily utensils are mass produced in factory settings with little attention to design, they do not satisfy our need to see, touch and use beautiful things every day. It makes sense, then, that handmade crafts are appreciated more than ever, because they are helping to fill this spiritual vacuum. I think that the driving force behind the current appreciation of craftsmanship is the growing tendency towards higher levels of both technique and design. In our house, we have dishes created by ceramists from all over Japan. The blending of different combinations of forms, textures and styles at each meal significantly enhances the quality of our mealtime experience. Well-designed handmade objects are like traditional art in that they universally appeal to people, regardless of their art background. As more people come to use well-designed objects in their daily lives, this appreciation of craft expands even more. Indeed. There is a paradigm shift there. I think that such shifts take about 50 years to soak into the general public. We can see that in the fact that the art and craft of 1950’s is now getting popular. Art is always at the forefront; it is natural for us to take 50 years to catch up with an aesthetic trend. Half a century? I don’t think I can wait that long. Me either. But in that sense, if the craft world can manage to stay in the forefront alongside art, we may be able to change the lifestyle of ordinary people all over the world in fifty years. Wouldn’t that be fun? As an active participant in that process, where do you want to see your work go? In addition to producing traditional work, I want to create work that transcends the needs of the Japanese lifestyle towards a more global standard. So, for example, with the same basic methods that I make buckets for the Japanese bath, I created a champagne cooler that can be of practical use anywhere in the world. I want to make things that are as functional in a house with carpeted floors as one with tatami mats. The universal element here, of course, is wood. Wood is appreciated by most cultures in the world. I relate to it because the connection with wood is very deep within Japan’s long history. For us, it is a treasure, and I embrace the challenge of creating many things by way of this very special medium. Japanese woodwork is often completed without the application of a protective paint or varnish. We see it in its natural state. When I was growing up in America, there were shops that sold unpainted furniture, and budget-minded people would take them home and paint or stain them. I always thought that the unpainted furniture was elegant and beautiful in the shops, but looked disappointingly cheap after being painted. So, I was surprised to see so much natural unpainted wood when I first came to Japan. If painted wood should develop a water leak due to a crack, the water gets trapped and the wood will eventually rot. This is critical for dishes and bowls, since they are frequently wet. That’s why we don’t paint them. There is also a spiritual reason why we often choose not to paint wood. As followers of Shintoism, part of our worship of nature is our deep respect for and feelings of awe towards natural wood. Our most sacred shrine at Ise is built entirely from unpainted wood. This Shinto influence affects our culture in many ways. Wood in traditional Japan seems to be either completely naked and natural or painstakingly lacquered to a degree of perfection not found anywhere in the world. Both extremes are exquisite. 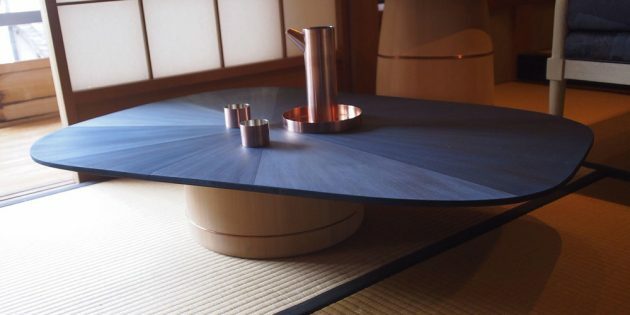 In most homes in Japan, we see a perfect example, often in the same room, with the family’s Shinto shrine presented in natural wood and a Buddhist altar that has been impeccably lacquered. It is a balance of extremes. That is an excellent example of Japanese esthetics. Have you visited Café Kanetanaka on Omotesando in Tokyo, designed by Sugimoto Hiroshi? The interior is powerful in its simplicity. The space consists of only two very long, tables made from unfinished, very light colored wood. The entire length of the room opens floor to ceiling to a simple garden. It is a strikingly beautiful space. Working with Sugimoto-san was really eye opening for me. I learned so much. I find so strange that, though people like Sugimoto Hiroshi or Sato Oki are so well-known and well-received abroad, they don’t get the recognition they deserve here, in Japan. So I come back to this again: Japanese people need to go abroad in order to be able to see the value of our culture. This is true for all Japanese people, not only artists. Both Sugimoto and Sato utilize their Japanese-ness in their work in wonderful ways. However, it is so natural and ordinary that many Japanese don’t even notice it within our context here and are therefore unable to evaluate it fairly. I think that coming to Japan from a culture that is relatively new like the U.S., it is easier perhaps to be moved and impressed by the skill level, beauty and creativity found here than for someone who was raised in this environment. That’s why I think we need to step back with some detachment or the traditional craft market will continue to shrink. Japan Handmade is approaching our domestic market and seeking to raise the value of traditional crafts in the eyes of the Japanese people by focusing our first marketing efforts abroad. Since Japanese tend not to perceive the value of things made here until they are first appreciated abroad, it is not uncommon for domestic sales of products to jump only after they become popular overseas. However, going abroad first is such roundabout process. It could take Japan many years to grow out of this attitude. And both domestic and international PR are part of your strategy? Yes. Establishing ourselves globally depends as much on PR and design as it does the skill level that produces the work. So Japan Handmade is moving forward by including PR and design in its model. With the addition of active collaboration, this group has stepped even further ahead of other traditional Japanese craft producing companies. You know, it continually surprises me that the people I meet from different art and craft-related fields all over Japan, often don’t even know each other. There is very little networking. You have a point. Ignorance is the biggest problem. Before we started Japan Handmade, even the six of us didn’t know each other. Though our industries are similar, there was no horizontal communication. Now, we are working together and using tools such as Facebook to share information and build a network. Japan Handmade is based in Kyoto right now, but we are planning the Shiga Prefecture version as well, which should be quite different from the Kyoto JH. This coming fall, a group of Shiga craftspeople are planning a group show in New York, which will be interesting to witness. Though I said that it would take 50 years to establish traditional Japanese crafts in the global market, it really could be a lot sooner. If we try hard enough, maybe we can cut that time in half. I’m glad that you said that. I really don’t think I can wait for 50 years since I’ll be 116 by then. I applaud the efforts of Japan Handmade to carry your respective families’ skills into the contemporary world, and introduce excellence in design and craftsmanship into the everyday lives of people throughout the world.